Well, Iowa just came off an impressive showing vs. the Ol Ball Coach's Gamecocks. It wouldn't be Bowl Season without speculation that Kirk Ferentz is heading to the NFL. This time it seems a little more plausible. Big time connections are contacting people's people's people, and the rumors are flying around like crazy. Jon Miller stated on his radio show that he thought Ferentz's chances of going to the Browns was "about 75%". That's scary stuff right there. The message boards are blowing up with different stuff right now. One of the latest rumors is Jake Christensen being done at Iowa. Although many people expected him to take off after losing the starting job, I had hoped he'd stick it out. Regardless of what happens, Jake has been one of the greatest teammates. He has been continually helping out Ricky and stayed focused while he was on the bench. The latest rumor of his leaving was found HERE on Hawkeyenation. 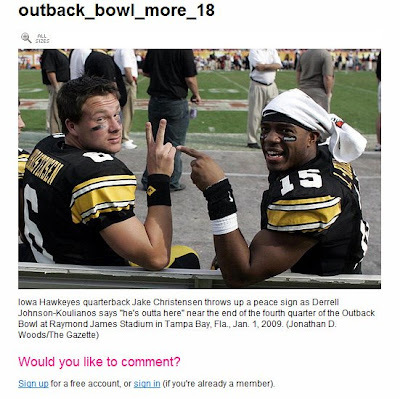 The link points to THIS PHOTO from the latter part of the Outback Bowl. The photo(s) are credited to Gazette photographers Jim Slosiarek and Jonathan D. Woods. It's no secret that DJK and Jake are tight. What's even more interesting is that DJK has canceled his Facebook account. Then again, the "he's outta here" might have been directed at DJK, as in he is leaving the stadium, see you later type of thing. EDIT: I am, by no means, advocating anything. I am just relaying what I've read and spouting off some of my observations.